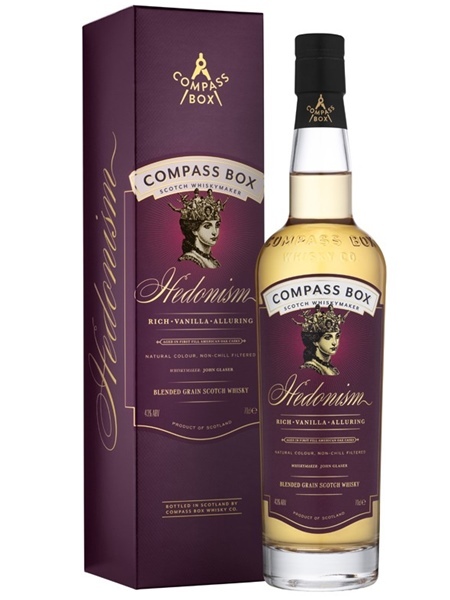 Hedonism is the blend of grain whisky from the recently closed distillery of Port Dundas in Glasgow and Diageo's largest, solely-owned grain distillery, Cameronbridge. As always, Compass Box shows full transparency with their receipe. 66% comes from first-fill, American, standard barrel grain whisky from Cameronbridge; 32% comes from first-fill, American, standard barrel grain whisky from Port Dundas; 2% comes from rejuvenated hogsheads of grain whisky from Port Dundas. Hedonism is natural colour, non-chill filtered and bottled at 43% ABV.